The streetcars for the M-1 Rail, a 3-mile transportation system along Woodward Avenue, will be equipped with technology that will allow the cars to operate by battery rather than an overhead wires. “The main innovation behind the design of the Liberty Modern Streetcar is its ability to manage off-wire operation. 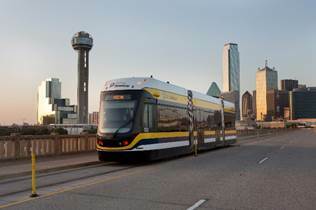 The streetcar will operate on battery on part of its route,” says Marion Van Fosson, president of Brookville Equipment, who has awarded a contract to the automation technology company ABB to equip the six streetcars. “The strong engineering collaboration between Brookville and ABB’s rail and traction team allows (Detroit) to benefit from efficient streetcar access to areas without overhead wires,” Van Fosson says. ABB will supply traction converters, traction motors, and cooling units. The streetcars will be able to travel without an overhead catenary system, an overhead line used to transmit electrical energy to the streetcar, for about 60 percent of the corridor. M-1 Rail, the non-profit organization leading the construction, purchased the six streetcars from Brookville Equipment for $32 million. The three-piece cars are expected to be 66 feet long and be able to carry about 125 passengers. M-1 Rail officials expect service to begin in the spring 2017, a delay from the original start date of 2016. The first two cars are scheduled for delivery in late 2016 and four more by spring 2017. The streetcar will run along Woodward Avenue in Detroit from downtown to the New Center area.